This is the last in my series analyzing the 2008 election in the state of Georgia. I looked at statewide numbers in my first article. 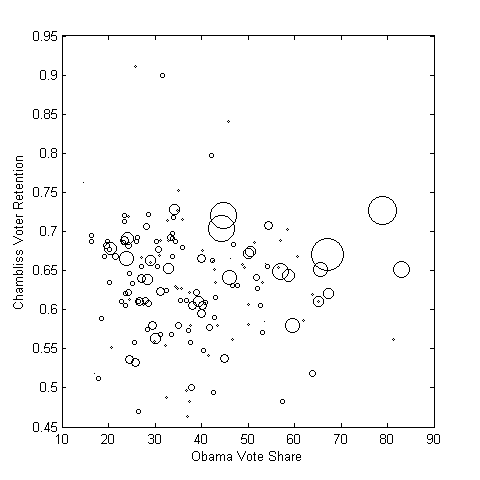 The next article looked at county level results and also racial polarization. In the 3rd article, I analyzed the results in Fulton county and specifically the precincts in which our team of Obama volunteers worked. Georgia has a law according to which a winning candidate needs 50% + 1 of the votes cast, otherwise there is a runoff election between the top two candidates. 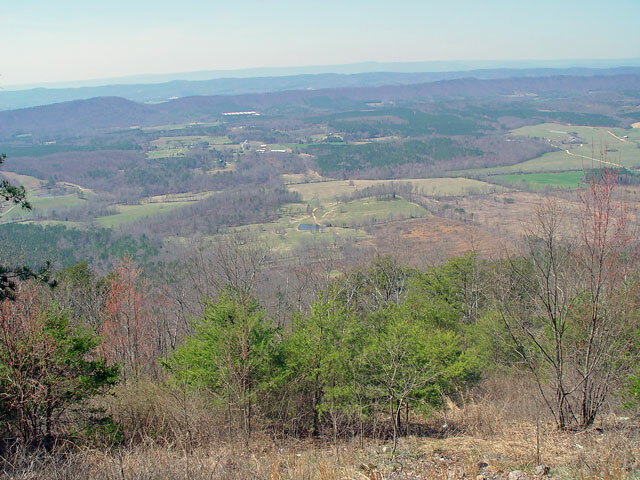 In the general election on November 4, incumbent Republican Senator Saxby Chambliss failed to get 50% and thus was forced into a runoff with the Democratic candidate Jim Martin. Interestingly, this was the second runoff for Jim Martin this year since he had won in a runoff election in the Democratic primary too after no one got 50% in the crowded filed of Democratic Senate candidates in the primary election. As you can see, a lot less people voted in the runoff than in the general election. Let’s look at the voter retention rate, i.e. the number of votes for a candidate in the runoff as a proportion of the votes in the general election. While only about 57% of the voters in the general voted in the runoff, they were not evenly distributed between the parties. Democrat Jim Martin barely managed to get half of his voters to pull the lever for him again while Republican Saxby Chambliss was successful with almost two-thirds of his voters. This is why the Republican margin increased from 2.92% on November 4 to 14.92% on December 2. Let’s plot the percentage of votes the two candidates got in each county in the general and the runoff elections. The circles represent individual counties and their area is proportional to the number of registered voters in that county. Chambliss performed better in all counties and Martin performed worse in almost all in the runoff when compared with the general election. 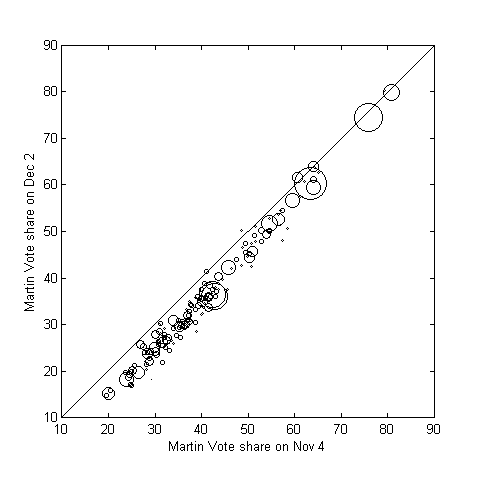 Another way to look at the data is to compare the vote retention rates for Chambliss and Martin. Chambliss got about 60-70% of his general election vote in most counties, especially the more populous counties while Martin only got 45-60% in most. 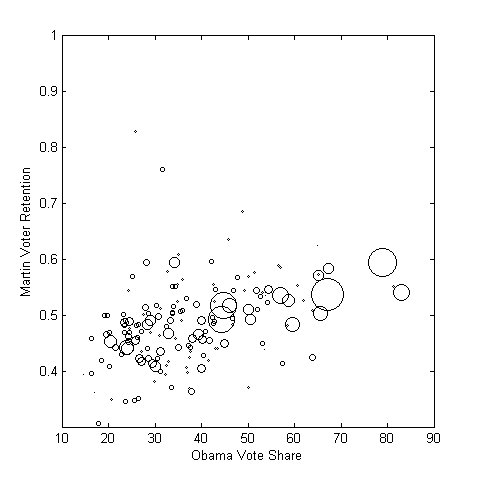 The only counties close to parity in terms of vote retention were really small. 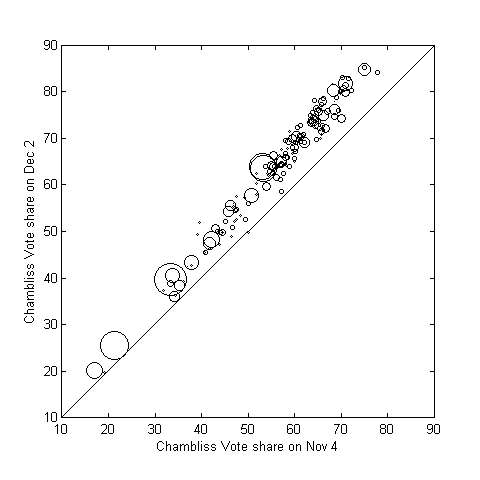 I was wondering whether there was any pattern to the vote retention in terms of partisanship. 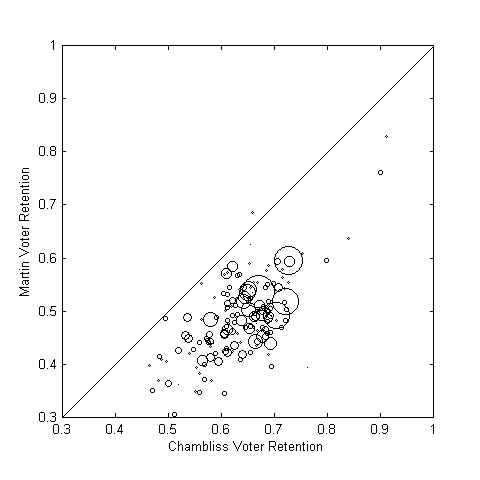 So I plotted the Chambliss and Martin retention rates against the percentage in that county that voted for Obama on November 4. This is a slight upward trend as the counties get more Democratic. However it is still very low. We see much less of a pattern here.